We’re often asked whether our books are sold and well received in Botswana – a natural question since that’s where they’re set. Botswana has a small population, and an even smaller group who read fiction, but all our books are always on sale in Gaborone. Still, you can imagine how thrilled we were when we met Nyane Angela Seiphetlheng, she was enthusiastic about the books, and decided to choose A DEATH IN THE FAMILY as the centerpiece for one of Botswana’s major arts and culture festivals that she organizes in the Shoshong area. It’s a great honor, and I’m going to be at the festival to enjoy every minute of it. Anyone planning a trip in southern Africa, please join us! I wanted to find out more about the festival and about Angela – who is one of Botswana’s amazing go-getters. She is one of those people who does the hard things at once, and takes a little longer to do the impossible! So I asked her about the festival and invite you to share the discussion. Would you tell us a little about the Festival and why it takes place in Shoshong? 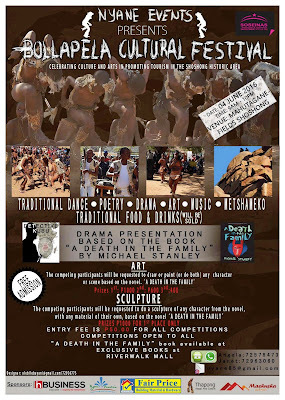 Nyane Events, will host a cultural activity on the 4th June 2016. 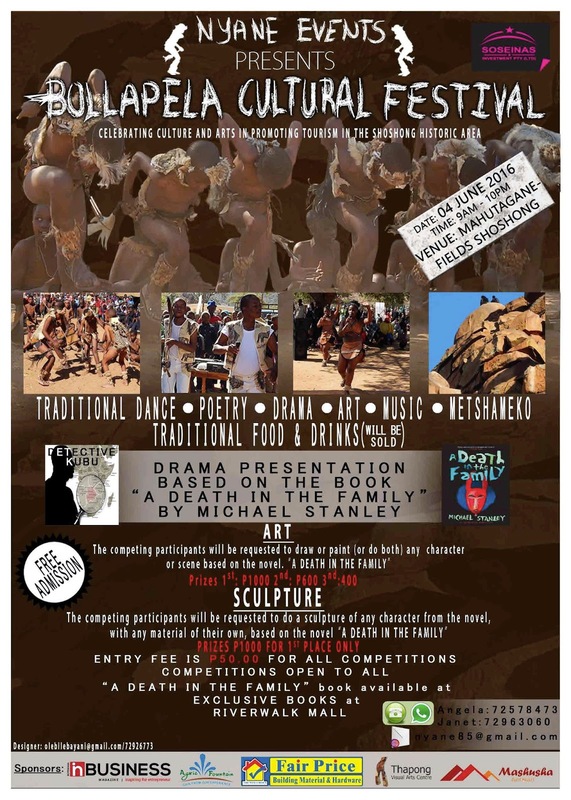 The cultural event in Shoshong will have a special feature to it based on a novel launched in August 2015, Botswana- Gaborone, by its authors Michael Sears and Stanley Trollip called, A DEATH IN THE FAMILY. This is a detective crime series novel with part of its setting covering Shoshong, Tobela, Mochudi and Gaborone. After a study carried out in 2010 around the Shoshong constituency, it emerged with areas for potential investment being Agriculture, Tourism; Eco-tourism, Mining, Solar Energy, Waste Management; Biofuel, Potential opportunities presented by the B112 road linking major villages of Molepolole, Shoshong and Serowe, to be marketed as a gateway to major tourist sites of Maun, Chobe, Okavango and Victoria Falls, to list a few. I am a member of a village development committee (Shoshong Your Investment Destination committee) and as its Vice chairperson, I am tasked with the mandate of taking the message to the world about this gem area of Shoshong constituency and it’s potential. Colonial Heritage includes buildings, and missionary heritage sites. Historical Heritage- Shoshong is the first village of Baphaleng, Bakaa, Bangwato, Bakgalagadi and other early Tswana Communities. Archaeological Heritage includes pottery remains, burials and monuments. 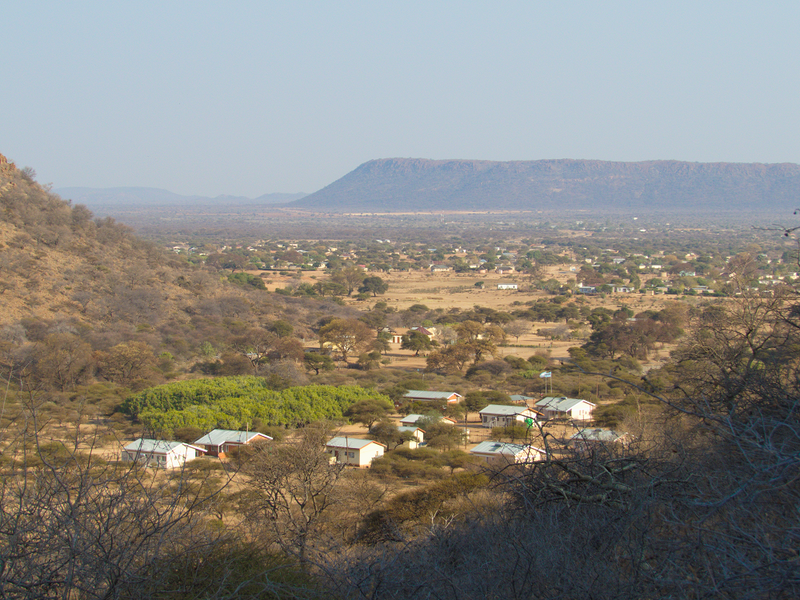 Natural Heritage include Hills that have historical storylines associated with them as well as rocks that are associated with the village identity such as Lesoso, bollapela, majwe-maswaana to list a few. The historic routes: There are also routes that link up Shoshong and Kalamare, passing through the Old Shoshong hill site, passing by the magnificent view of Sogwang. This route is less than 20km. There is also a breath taking route to Mmutlane that can take less than 15minutes going on top of the hill from Shoshong. When you are in destination Mmutlane at the hill top, there is flat land. This route has been used for years and is still being used to date. It is against this background that the Bollapela Cultural festival will try to promote tourism, culture and arts in the form of dramatization of certain parts of the novel, drawing or painting as well as sculptures of scenes or characters from the novel. This will form a great part of the celebrations of the cultural day activities of traditional games, music, ancestors worship, folklores and stories of Shoshong area. CELEBRATING CULTURE AND ARTS IN PROMOTING TOURISM IN THE SHOSHONG RICH HISTORIC AREA. What persuaded you to have Detective Kubu as the centerpiece of this year’s festival? I read the first Michael Stanley novel- A CARRION DEATH - and got hooked from the day I opened the first page in 2015. As I got to follow them as I was also researching on Shoshong and its surrounding areas to promote, I came across information that their fifth novel was to be out by August same year and its partly based on Shoshong and Tobela. I couldn’t wait to see what the big, opera and wine loving Kubu would be doing in my village Shoshong. The novel not only embraces a great place in Botswana with a rich historic background but also promotes the area internationally as a potential tourist destination. Detective Kubu had to be celebrated in Shoshong and the 2016 cultural event had to embrace him for his services in Shoshong. And on a personal note, I love the work of Detective Kubu because I grew up watching my father, the Late Kgakgamatso Seiphetlheng who was a famous Crime Detective Investigator in Botswana from a small village in the middle of a horse shoe of hills- Shoshong. Admired by a lot of his peers in the police department, having worked in areas of Maun, Lobatse, Palapye, Francistown busting crimes and catching thieves. Well-known as Silverfox by women, children and criminals. He was also called as part of the investigation team for the ritual murder case of the young girl Segametsi Mogomotsi at Mochudi. I am also excited that Michael Stanley wrote DEADLY HARVEST novel based on this incidence. I so wish my dad was around to appreciate this art. That’s fascinating Angela. We were told about the Mogomotsi case by a previous director of the CID, Rra Mulale. We knew that one day we would have to write a book based on it. I wish we had met your father. Maybe our detective would be called Silverback instead of Kubu if we had! What attracted you to A DEATH IN THE FAMILY in particular? I found the novel to be God sent, a novel that touched on issues of culture, effects of developments on culture, youth, the elderly and change, mining in the area of Shoshong- Tobela, the rich history found in the Shoshong area and the huge potential it has on tourism. It also talks of corruption that comes about with globalization, invasion of the Chinese into Africa, particularly Botswana and the Americans. All these aspects are covered in a creative manner, by great authors, passionate about Botswana and they packaged the Shoshong area in an artistic way that would attract both the young and elderly to take a moment and look at Shoshong and Tobela. I’m really looking forward to seeing how the groups interpret the issues that we raise in the book! Has there been a lot of interest in the theme? The part that will be dramatized are the ones where activities happen at the Kgotla. The theme derived of the novel is- How the Kgotla setup can enhance the development of rural communities through fruitful deliberations from both the youth and the elderly. There has been lots of excitement around this theme from the village leadership being Chiefs. The Chairpeson of House of Chiefs- Kgosi Gaborone is aware of this project, the Shoshong chiefs have been made aware and will be launching the Kgotla that will be built at the events venue. Not only will this Kgotla be used for drama but the Chief would like to do all official opening of event and welcoming of Chief Oscar Mosielele of Moshupa- the guest speaker at that Kgotla to embrace our culture. Kgosi Mosielele already has a copy of A DEATH IN THE FAMILY. The Shoshong youth drama group (Black Tswana Drama Group) who have been struggling with exposure and having a career with what they love most being drama have read the novel and excited to be given this platform. It’s the passion they have to try and wow the world about their skill and a great novel. Regardless of the financial challenges they are facing now to meet since they travel from Shoshong to Kalamare to meet up with other team members, it’s the passion in their eyes created by this novel that melts me. Most of them are unemployed. One of the unemployed young ladies in her twenties from Shoshong heard me making a presentation about the event and asked to read the novel. She completed the novel in 3 days saying she couldn’t put it down. She has since produced a song about Detective Kubu. Would you tell us a little about the food that will be available at the event. Setswana variety of foods will be at the event. Bogobe jwa mabele (sorghum meal), bogobe jwa lerotse, seswaa (pounded meat), mokoro, nama ya tlhogo, serobe (tripe stew) sebete (liver stew), morogo wa dinawa (beans leaves), phane worms. There will be game meat, game biltong and sausages. As a way of appreciating the international features of the novel, we will be having Chinese and American foods stalls, to embrace the different cultures that determine the diet of people of Botswana and Shoshong now. Do you feel the Detective Kubu novels realistically reflect life in modern Botswana? I know you will be absolutely honest! YES, YES, YES, Ohhhhh YES. That’s why I easily related to it. I visualized the areas and activities of the novel that I can’t wait for someone to do movies of series for Detective Kubu. I guess that why I wanted to see how people could translate it in drama, paintings or drawing of scenes they visualize as they read the novel. Angela, thanks so much! I’m really looking forward to being at the festival. It will be a highlight of the year! Sounds wonderful, Angela! I wish I could be there, and I hope that it turns out great for all of you.